Finding a quiet spot to workout or meditate can be difficult, especially with a full house. So, get away from the clutter of your home so you can fully engage in your yoga or meditation routine. 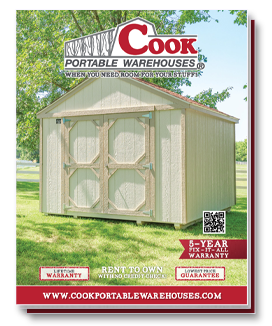 Cook portable buildings hold many shed possibilities! From an office to a hobby room and more, Cook sheds can be almost anything you need! They are also a great option to create your own yoga room! Why is this a great choice? It’s a durable blank slate! Check out all the features of a Cook shed. You can skip the yoga fees and the travel time by working out in your own backyard shed. You enter Cook’s rent to own agreement, you have the option to trade up to a larger shed if you decide you need it for storage as well as a yoga room. There are so many possibilities for making a great yoga room out of a shed. Of course you can peruse pinterest for yoga room decor ideas, but keep in mind what aspects will help you relax and stay focused. Here are some great ideas to try out! Remember to consult your doctor before you decide to workout on your own without guidance from a yoga instructor. What do you need for your yoga shed? If your local yoga instructor uses essential oils in class and you’ve enjoyed those, you might consider adding them to your own yoga room and practice. Here’s some basic information about essential oils being used in yoga practices. First, consult with your doctor before using essential oils or doing yoga on your own. They may be able to help you determine what types of essential oils to try. You may want to include some extra yoga mats, blankets, cork blocks, etc. That way if you have a friend that joins you occasionally or if your kids want to try it out with you one morning you’ll have the supplies they need. Add a sound system or battery powered bluetooth speaker to play relaxing, meditative music at a soft level. Paint in muted tones, such as a soft lavender or off white. Check out a few of these color options! This will help you enter the room and immediately feel comfortable and relaxed. Also, with these softer colors it will give the room the appearance that it is more open and bright. If you want to add these amenities you may need to look into adding electricity to your shed. You may be fine without these extras in the fall or spring, but as winter comes in or summer begins, you may need these for your safety as you work out. Remember adding electricity is not something to take lightly and you will need a professional electrician to add it to your shed. You also will need to contact your local government to see if there are any permits you will need before adding electricity to your shed. Read more about this here! Choose items to hang that will help you relax. Remember minimalism is a good thing! You want to give yourself a place to focus on your body and your breath and not necessarily your surroundings. But, if there’s a mantra or verse that helps you focus, add it to a wall. Or add calming landscape scenes to your walls. You could even hang a beautiful rug from the ceiling if you would like. After you’ve had a good workout and are relaxed, before heading back inside your home to the hustle and bustle of the day, take a few minutes to just enjoy the quiet. Read, journal or just relax quietly as you sip your water. Add a comfy chair and lamp to a corner and you’re all set! If you want a more intense workout in your shed, then here are some other ideas for creating a backyard gym! Looking into buying a shed? Download our FREE questionnaire below to help you decide on the right fit for you.